Diamonds’ game plan was executed almost to perfection. Andy Peaks referred to his ‘game plan’ during the post-match interview and, in truth, it seemed like his AFC Rushden & Diamonds side did exactly what they set out to do. They gave up plenty of possession to the higher-ranked side and trusted themselves to put in a disciplined display. They did just that. They defended well, got their blocks in and, when the opportunity arose, they got forward on the counter-attack. And, in the end, with Liam Dolman seeing a shot deflected onto the post and then a big chance for Tom Lorraine going begging at the death, Diamonds could have nicked it. The game plan that Peaks and his staff laid out was executed well by the players. It was just a shame they couldn’t finish the job from the penalty spot. 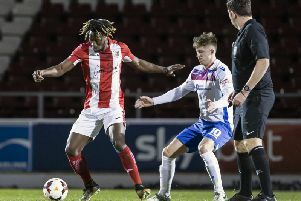 Brackley showed glimpses of their quality, particularly in the shoot-out. As disciplined as Diamonds were, there could be no denying that Brackley had their moments where you could see the difference between Step 2 and Step 3. They kept the ball well and certainly went close, mainly with long-range efforts, to breaking the deadlock in the second half. I haven’t been following them closely this season but I understand they did make a few changes with their focus, understandably, being on the Vanarama National League North play-offs. However, you could still see the extra quality at times and they certainly showed it in the penalty shoot-out. Ben Heath was given little chance with their four successful spot-kicks while Brackley goalkeeper Danny Lewis was good enough to stop two of Diamonds’ efforts. Alex Collard will go on and play at a higher level. 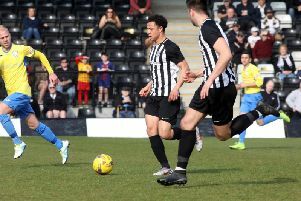 In general, Diamonds have been pretty good as a defensive unit this season and that Alex Collard has played a key role in that since he joined the club towards the end of last year. Talk about a good bit of business, his arrival has been one of the best signings Andy Peaks has made. He is big, strong, wins his headers and has a cool head on his shoulders. He has also struck up a very good partnership with the ever-reliable Liam Dolman. Collard stood out from the rest with this performance and his display against an attack from the league above was just further proof that he will go on to play at a higher level in the future. There needs to be a re-think over the scheduling of the Hillier Cup final. Don’t get me wrong, I firmly believe the NFA competition has its place in the football calendar in this county. But the timing of the final does confuse me. Like this year, it is usually organised to be played during the last month of the season and that’s something I struggle to get my head round. We have been fortunate in recent seasons to have our local clubs challenging for honours in the league and, to be frank, the Hillier Cup final is something they don’t really need when they are trying to achieve promotion and help keep non-League football in Northamptonshire firmly on the map. Like I say, the Hillier Cup does have its place but surely it would be better to have the final as just that. The final game of the season in the county, sometime in May? You have to move on, both teams have much bigger fish to fry. Diamonds will, of course, be disappointed that they didn’t get their hands on some silverware at Sixfields. But the bigger picture is that five huge games lie ahead for them in the Evo-Stik League South Premier Division Central. It’s been a fantastic debut season at Step 3 so far but there is still that slight chance that they could squeeze into the play-offs. They are probably going to have to win every game, which won’t be easy by any stretch. But while there is a chance, they must keep going. More importantly, they won’t want to undo the good work they have done to this point, even if they do miss out on a top-five finish. Likewise, Brackley will be moving on quickly as they get another shot at the play-offs in National League North. Ultimately, the only way these clubs keep themselves on the map is by performing well in their leagues and that is where their focus will now be.